If anyone had been in another planet of late, we are talking about the trio of Dwyane Wade, LeBron James and Chris Bosh. Of course, this is if you are a sports fan, as many people think of Miami as the place taken by the Kardashian trio sisters. It is summer time, and that means it is time to see such beauties as Kim in South Beach. So lost in the thoughts of sunshine and basketball are the Florida Marlins. As of now, not many people in town care about its team. The reason is a simple one: At the moment, it looks as if the franchise is looking toward the 2011 season and giving up its pursuit of the National League East crown or a wild card berth. Most of South Florida chatter right now concerning October is all about the aforementioned Heat and its opening night in Miami against the Orlando Magic (October 29), or where the Miami Dolphins and the University of Miami Hurricanes will be in the standings around that time. 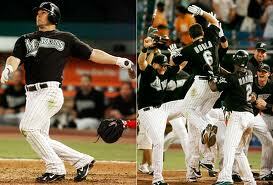 That is sad, because if Miami was a real baseball town the talk would have Dan Uggla as the man of the moment. The should have been All-Star continued his recent home run binge, hitting his eighth in the past 10 games off Philadelphia’ Roy Halladay. It was Uggla’s 24th homer of the season. As part of his homer spree, he became the Marlins franchise home run king, passing former Marlin Mike Lowell (143) July 31 against the San Diego Padres. That is kind of unbelievable considering sluggers such as Gary Sheffield, Derrek Lee and Miguel Cabrera were once Marlins. In the process, Uggla has established himself as a threat to Jeff Kent’s mark of nine consecutive 20-homer seasons from 1997-2005, the present major league record for a second baseman. But besides Uggla there are other second baseman making its own run. Uggla already extended his streak to five years, while Philadelphia’ Chase Utley, currently on the disabled list, can run his streak to six with nine more dingers this year. Cincinnati’s Brandon Phillips needs six home runs to extend his 20-homer streak to four. Last season Uggla became the only second basemen in history to hit 20-or-more home runs in its first four career campaigns. The other one was Hall of Famer Joe Gordon, who did it in four straight seasons from 1938-41. Uggla, 30, also became the fastest second baseman ever to reach 100 homers. At the moment, Uggla leads all second baseman with 145 homers since 2006. He also ranks 13th all-time in home runs by a second baseman. And despite all that production, Uggla is going under the radar. And that is regrettable. Even if the Marlins’ playoff hopes are gone, this is a player right now to watch. The Marlins brass has been on the record stating that they are listening to offers from other clubs, and they have not been clear if Uggla could be on the market. Everyone knows the Marlins are sellers at the moment. However, lately it has been said that they are internally discussing the possibility of signing their Uggla to a long-term contract. It is true that the Marlins are Hanley Ramirez’s team, just like the Heat is Dwayne Wade’s team. But Uggla could be the LeBron James to Ramirez’s Wade. Most people forget that when Ramirez was selected in 2006 the National League Rookie of the Year, it was Uggla who won the same accolade from The Sporting News and the players association. It is understandable it is not the most easiest last name to remember. But no matter how everyone pronounces it Uggla is the man right now. And right now that means that the Marlins need to retain him in their lineup when they do open their new stadium in 2012. Ozzie Guillen: Spokesman For MLB Latinos?